Detailing the physical features, habits, territorial reach and other identifying qualities of the Water Scavenger Beetle. Water Scavenger Beetles may look the part of the villain but these aquatic insects are a beneficial addition to any water ecosystem. Water Scavenger Beetles are excellent swimmers with streamlined, hydrodynamic bodies. Their feet are feathered to help propel them through water. They breathe air and trap it under their wings before diving below the water's surface, using it to respire while underwater. They resemble Predaceous Diving Beetles. Water Scavengers have little clubs at the end of their antennae while Predaceous Diving Beetles do not. Water Scavenger Beetles are predators and some eat mosquito larvae, naturally reducing the size of summertime mosquito populations. Others are herbivores and scavenge off of aquatic plants. Even their larvae are omnivores, eating small insects, detritus, and other debris in the water. Occasionally adults can be seen on land near lights, which attract them. 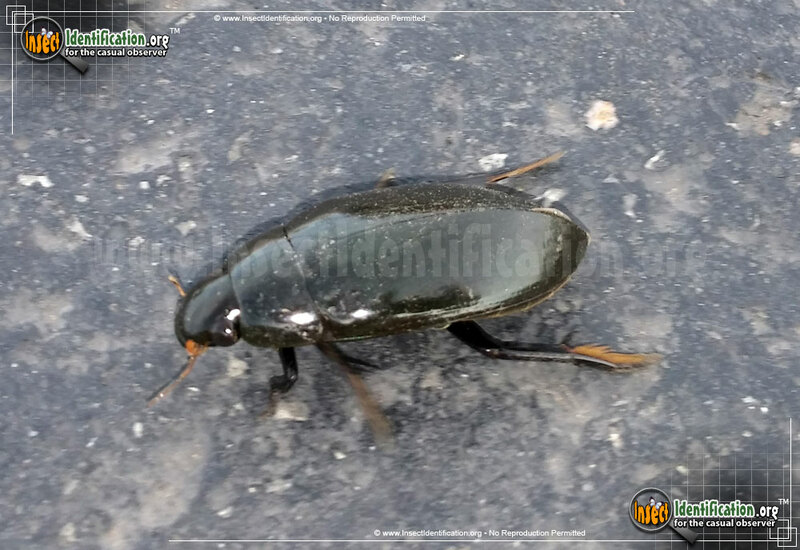 They are large as adults and can be found in or near any type of water like lakes, ponds, streams, and pools.